The first step is to schedule a complimentary design consultation at your home. During this consultation, we will custom design a lighting system specifically for your home and its unique architectural elements. More importantly, we will listen to you to find out what your personal taste and needs are. Once completed, you will have a lighting system that is designed specifically for your home, and the appearance of it will be like no other in the neighborhood. We will also provide you with an extensive reference list so you can see some of our work in and around your area. Once an agreement has been reached, we can usually install your system within ten days. 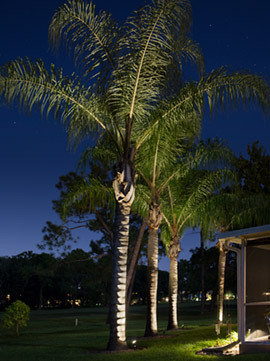 When we install our lighting systems, no machinery is used and we don’t disturb your yard and landscaping. Every aspect of the installation is done by hand. When we are finished, there is almost no evidence that we have been in your yard until nightfall when your property becomes a nighttime work of art…….. Are you ready to experience the difference? Johnson Landscape Lighting uses the highest quality materials available to ensure that your investment will provide you with many, many years of hassle-free enjoyment.